Singer/songwriter Bill Withers is not very well known but he had a very successful career thanks to three huge hits, “Lean On Me”, “Use Me” and, of course, “Ain’t No Sunshine.” Two musicians from Booker T. and the MGs, my favourite band as a teenager, played on his recording of “Ain’t No Sunshine”; bassist Donald “Duck” Dunn and drummer Al Jackson, with Booker T. himself producing. It was Booker T. Jones’ superb B3 organ playing which inspired me to initiate this B3 project. Also, playing keyboards somehow brings me closer to my brother Gabriel, who died so many years ago but is always a part of my life. The traditional gospel song “Sign of the Judgment” has been recorded by several gospel choirs and singers, like the excellent McIntosh County Shouters. Today is the birthday of Alphonse Villeneuve (dit Amyot), the man who became our third grandfather. 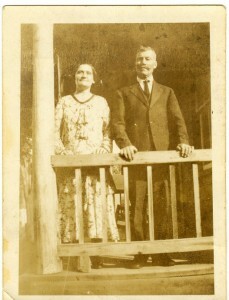 He married my maternal grandmother a few years after my grandfather Comtois died in 1915. My family always referred to him as Pepère Villeneuve. This is the only picture of him, with my grandmother, probably taken at their wedding. They both lived with my family until their death, my grandmother in 1947 and Pepère Villeneuve in 1960. I was 10 and he was 95. Pepère Villeuve was the most influential person in my life, after my father. He was everything I was not and everything I wanted to be. He was blessed with remarkable health, strength, piety and character, the likes of which are beyond the reach of men of this day. In 1978, I wrote a piece in his honour, simply called “Pepère Villeneuve”, but I was only able to record it in 2004 on my CD “From Stone.” Here is the piece. Thank you, Pepère.